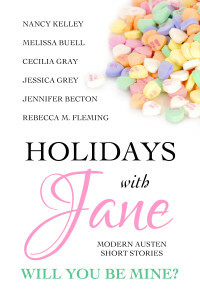 Love is in the air this Valentine’s Day as the talented authors of the Holidays with Jane series bring you six more modern adaptations of Jane Austen’s classic novels. This candy heart is filled with chocolates, roses, and happily ever afters! Life has been a series of second guesses for Gracie Elliot since she called off her engagement to sought-after ring designer Derek Worth. Eight years later, Derek is back in Northanger, Georgia helping his sister plan a Valentine’s Gala and Gracie wonders if she has a second chance to design her love story. Catherine Moreland is a graphic designer by day and paranormal romance fangirl by night. Hoping to live out her supernatural fantasy, she jumps at the opportunity to spend Valentine’s weekend at the most haunted inn in Savannah, Georgia. Will Catherine’s fantasy become reality? Or is she just a silly fangirl? Chawton High theater teacher Marianne Wood is no stranger to drama. Her breakup with a fellow teacher is the gossip of the school. Marianne’s sworn off dating co-workers—and maybe even men in general, but every time she turns around, football coach Drew Brandon is tempting her to change her mind. As the dreaded Valentine’s Day dance approaches, will Marianne learn that drama-free doesn’t have to mean boring? Emma Woodhouse is Highbury’s Cupid. She’s been matching her friends up since high school, and now, she owns a business sending secret admirer notes. But as the Valentine’s Eve Gala approaches, one of her arrows goes awry. Plus, someone is wooing Jen Fairfax, and Emma doesn’t know who it is. Can she regain her magic touch in time to find true love herself, or will Cupid have a lonely heart this Valentine’s Day? Living with the Bertram family in order to attend prestigious Sotherton Academy is Felicity Price’s best prospect for a college scholarship. It isn’t all bad given that she is able to see Everett Bertram frequently. Felicity hopes that the True Hearts Ball will be when Everett finally sees her true heart. After concealing love for so long, can it spark to life? All actress Liz Benoit wants for Valentine’s Day is to wrap filming on the Heartfield movie so she can write the screenplay that’s been bumping around in her brain. Sure, the town of Heartfield is charming, but she’s had her fill of working side by side with insufferable producer Darcy Williams, who never wanted to cast her in the first place. Fortunately for Liz and Darcy, Heartfield has a way of making people fall in love—with the town and with each other.